Georgi Tomov could not quite continue his series of top tournament results, without disappointing though. His chances received a blow in rounds 5 and 6 when he lost to fellow Europchessian Paula Gitu and Philippe Uhoda. He recovered with three consecutive wins to finish in shared 6th place (15th by tie-break) and a score of 6.0/9. 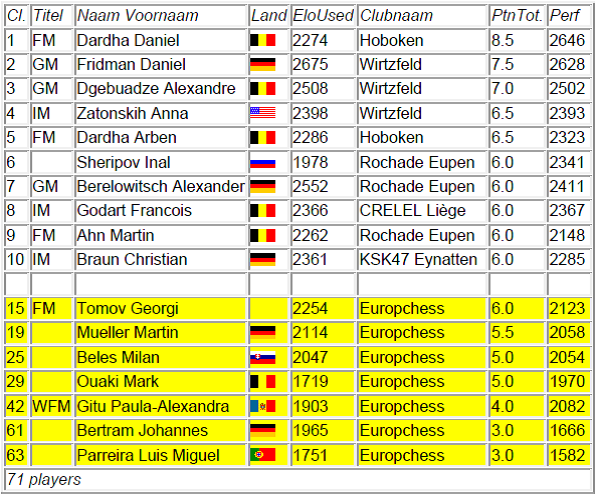 The second best Europchess player was Martin Mueller with 5.5/9 on 19th place, performing more or less on his rating level (distorted a bit by a loss against Inal Sheripov, who performed surprisingly strongly – apparently he made a comeback after a long period of inactivity). Also Milan Beles confirmed pretty much his level with 5/9 and a performance of 2054. Highlights were his draws against FMs Lennert Lenaerts and Dmitrii Marcziter. Mark Ouaki played once again a good tournament performing 250 points above his rating, and beat 4 higher-rated opponents, including his team-mate Johannes Bertram. Under the bar of 50%, Paula Gitu finished with 4 points. However, her performance of 2082 was nonetheless strong. In the first half of the tournament she beat three FMs. However, losing the last 4 rounds in a row left a bad taste of the tournament. Johannes Bertram and Luis Miguel Parreira however both had a horrible day. With 3/9 and performances of 1666 and 1582 respectively, they performed way below their level (Johannes even delivered the biggest underperformance of the tournament). The Championship was won by 13-years old super-talent Daniel Dardha who scored a whopping 8.5 points, to finish one point ahead of Elo favourite Daniel Fridman.